These recordings were first issued on Auvidis-Valois which was either part of or was taken over by Naïve who have bundled these five discs into Volume 2 in the label's Musique Française series. By the way, Volume 1 had the same lineage with five CDs focusing on the music of Alkan, Hahn, d'Indy, Jadin and Saint-Saëns. You may well find it difficult to track down these sets but the individual discs are accessible enough. I have listed them as separate entities at the end of this review. The series still has drawing power given its concentration on comparatively unusual French repertoire of the nineteenth century to the mid-twentieth. All the discs are well documented in French and English. Recordings are vivid as are the performances and do not let down this rarely heard music. Playing times are respectable but not overly generous; approaching an hour in each case except for the circa 74 minute Schmitt disc. Ferroud, who died young, is hardly ever mentioned but this disc certainly seems to do him justice. The three-movement 1930 Symphony leads the listener through furiously athletic first and third movements clearly taking a tincture from Stravinsky but emotionally ambivalent. The middle one is far from innocent; deeply troubled and teetering on the brink of some catastrophe. That oppressive tension also arches over the last movement. It was premiered by Monteux in Paris. Types is in three movements and combines wit with raucous heroism, cool invention and dizzy flightiness. Foules (Crowds) is one of the earliest works here: ambivalent and moody. The Sérénade is an almost chilly fantasy. It can be thought of as an icy and thoughtful amble through the garden from Ravel's Ma Mère l'Oye. There is a Ferroud orchestral disc from Marco Polo but I do not recall it being as fluent and direct speaking as this. It includes the Symphony and the Sérénade but adds works not included here. Lalo's ballet Namouna (1882) is heard here in its full sixteen movements. The 'plot' tells of two young lords who live a life of lotus-eaters yet find energy and time to be in mutual conflict. It shares the mood of Massenet's Le Cid. The movements are fairly short: 1:33 - 6:46. Beguiling charm and a few stern interjections are the order of the day. The performance is lively. Jean Martinon recorded the two Namouna suites (only ten movements) with the Orchestre National de l'ORTF in 1971. The label was DG who also added Lalo's Rhapsodie Norvégienne. As far as I know that never made it to CD, which is a pity; it was a very vivid account. This disc was reviewed here in more detail in 1998. The voluptuous music of Florent Schmitt, friend and contemporary of Vaughan Williams, has been doing well on disc of late. This is most notably courtesy of Naxos, Timpani and Dutton. The single major work here, running to 38 minutes, is the Symphonie Concertante. It would work well alongside Scriabin's Prometheus, Bax's Winter Legends, Balakirev's Thamar and Lyapunov's Hashish. It's a work of surging tides, black enchantment, morose restlessness and fantastic landscapes. There's a touch of Ravel but everything is more complex, honeyed and dense. Hüseyin Sermet is no stranger to Schmitt. He has a Naïve-Auvidis-Valois Schmitt disc to his name but that one treats the composer's major chamber works. The Symphonie Concertante was premiered in 1931 by the composer with the Boston SO conducted by Koussevitzky. It was later taken up by Monteux, Paray, Mitropoulos and Inghelbrecht. More mist and moodiness comes the listener's way in the luxuriously suggestive Rêves from 1913. Schmitt finds time for relaxation and a lighter hand in the eight movements of Soirs (1890-96). The temperature is cooler and the textures clearer. The music floats between Ravel, Delius and Bax. The pulse is agreeably relaxed; a nice contrast with the other two works. I should add that Timpani have at long last recorded the long neglected Introit, Récit et Congé for cello and orchestra. For years this was known only through the good offices of French radio broadcast tapes by André Navarra and Sophie Gastinel. Now you can hear it in the hands of Henri Demarquette with Orchestre National de Lorraine and Jacques Mercier on Timpani 1C1212. For many who know Tournemire at all, it is because of the considerable quantity of music he wrote for solo organ. In fact there are eight orchestral symphonies, often with an organ part as here. 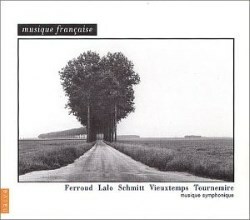 In the 1990s Auvidis-Valois recorded numbers 3 Moscow (1911), 5, 6, 7 Les Danses de la Vie and 8 Triomphe de la Mort (1921) with the Liège PO conducted by Pierre Bartholomée (V4794, V4793, V4757). Tournemire's Sixth Symphony varies between gentle giant with gleamingly impressionistic textures and beatific singing and a towering statement that reels with punched out energy and anger. It is in two grand movements, the second of which ends in chilling magnificence with trumpet calls cutting like lightning-strikes across a massed triple forte statement. The symphony dates from the years of the end of the Great War. Those diligently pursuing the Hortus and Phaedre series tracking the music of the Great War need to add Tournemire's symphonies of the years 1914-18 to complete their perspective. The sung words are given in French and English but separately rather than in parallel. I should just mention that Marco Polo and then Naxos Patrimoine issued a complete cycle of the eight symphonies using the Moscow PO and Antonio de Almeida. While the Fourth and Fifth Violin Concertos by Henri Vieuxtemps basked in the loyalty of the grand masters of the violin the other concertos rarely made it out of the dust and shadows. This disc saw what were real novelties during the 1990s rise in fair splendour out of obscurity. All this was courtesy of Gérard Poulet and this Liègois orchestra with the ever-attentive conductor Pierre Bartholomée. Violin Concertos 6 and 7 have winning smiles and in this case you can forget the oxygen-starved balances favoured by Heifetz. Here the two concertos laden with fragrant Mendelssohnian charms reach out endearingly to the explorer. It may be me but Concerto No. 7 does seem to have taken on a Hungarian tang which may in part be due to Hubay's orchestration. The Greeting to America Fantasy wraps a Bruch-like eloquence around what Jean Gallois in his booklet note calls "burlesque variations on 'Yankee Doodle'". It's a bit of fluff and no doubt served Vieuxtemps well during his first tour of the USA. If you are looking to make comparison with the Vieuxtemps competition then look out for a complete set of the concertos on Fuga Libera, Hyperion's Greeting to America (Chloe Hanslip) and the Naxos Keylin disc of concertos 5, 6 and 7. This set, both collectively and as individual discs, makes a valuable and often pleasing cross-section of little frequented byways of the French repertoire.